The French label Tempéraments is a great source for lovers of French keyboard music, and especially music for the organ. It is not only the repertoire which makes the releases of this label interesting. One also gets the chance to hear fine historical organs from across France. 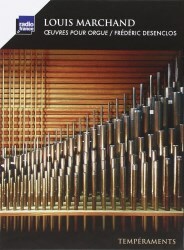 "By recording some very characteristic instruments made during the seventeenth, eighteenth and nineteenth centuries, 'Tempéraments' sets organ music in its broadest context, whether intended for the liturgy or to be heard during a concert", according to the booklet. This time it is the organ of Sarlat Cathedral which can be heard. It was built in 1752 by Jean-François Lépine - pupil of the famous Dom Bédos - and restored to its original glory by Bertrand Cattiaux between 2001 and 2005. The music chosen by Frédéric Desenclos is taken from the oeuvre of Louis Marchand. He was born in Lyon, and was in Paris at least from 1689. Here he held several positions as organist. In 1706 he was appointed organist of the Chapelle Royale, as successor to Guillaume Gabriel Nivers. He was highly respected as a musician and teacher, but far less as a person. He soon acquired the reputation of being a difficult character who didn't hesitate to manipulate people to boost his career. In a booklet to a recording with his harpsichord suites I found this description of the man: "Restless, cumbersome, self-conceived, slightly paranoic, ambitious to the point of awkwardness, ready to trample underfoot all the musicians in the Kingdom to achieve his aims, and using means such that even the most tolerant became indignant, a bad husband, a bad father and a bad man ...". His place in history is also due to that famous story - whether true or not - that he slipped away from a contest with Bach in Dresden. This could give the impression that he was Bach's inferior but that seems unlikely. His organ music is often technically demanding and virtuosic. The plein jeu which opens the Premier Livre, for instance, is in six parts, two of which are to be played on the pedalboard. That is quite exceptional in French organ music. Another brilliant piece - and his best-known organ work - is the Grand Dialogue of 1696 and the only piece in the third book. The latter is one of four books of unequal proportion which have been preserved in manuscript in Versailles. Only the first book was published posthumously in 1740. The total number of his organ works is estimated at around fifty. Stylistically Marchand is rather conservative. One looks in vain for the influence of chamber music or of opera. These pieces entered the realm of organ music at the time and were the first signs of a 'secularization' of organ music during the 18th century. The fact that Marchand was active as an organist in church implies that many pieces were written for liturgical purposes, especially for the alternatim practice. It was often left to the interpreter to choose which piece to play at which moment during the mass. The Suite in A from the second book includes a number of pieces connected to the Te Deum but there are no indications as to which verses they should substitute. As was common practice in French organ music several pieces refer to specific stops, such as basse de trompette, basse de cromorne and tierce en taille. That makes it difficult to perform this repertoire on other types of organ. This is probably the reason why French classical organ music is not that well known outside France. This makes it all the more important that discs like this are widely released and include liner-notes in English, as is fortunately the case here. Desenclos is a specialist in French music, not only as an organist but also as director of the Ensemble Pierre Robert. He delivers splendid performances with the help of the magnificent organ in Sarlat Cathedral. Music, performance and instrument are of superb quality.